Commenting on Ian Easton's scenario of a military confrontation between China and Taiwan, Russian military expert Vasily Kashin noted that the US cannot currently afford to further aggravate tensions with China and declare a "cold war" with Beijing over Taiwan. 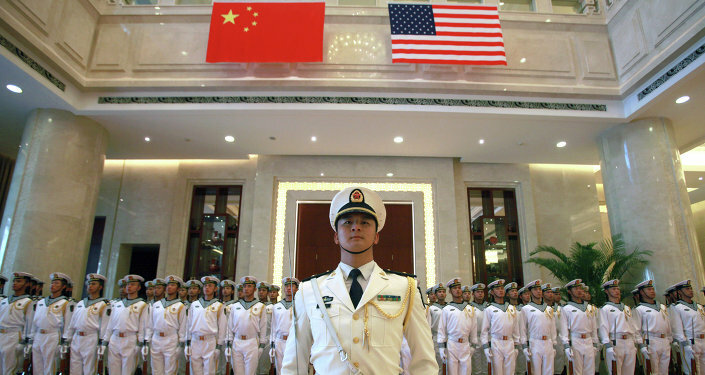 While the US military circles are inclined to regard China as a potential major rival, Washington won't be capable of efficiently containing Beijing in the long run, Vasily Kashin, a military expert and senior research fellow at the Institute for Far Eastern Studies of the Russian Academy of Sciences, told Sputnik China. Kashin drew attention to the book by Ian Easton, a research fellow at the Project 2049 Institute, "The Chinese Invasion Threat: Taiwan Defense and American Strategy in Asia" that presents a scenario of the Sino-Taiwanese conflict and US military options regarding in the hypothetical standoff. The timing of the research work is hardly coincidental, according to the Russian expert: "Before Tsai Ing-wen's assuming power [in the country], Taiwan was rarely considered a potential hot spot in Asia with [worldwide] attention primarily focused on the South China Sea, Sino-Japanese contradictions and the situation on the Korean peninsula." However, the victory of Taiwan's liberal Democratic Progressive Party (DPP) in the 2016 presidential elections and the emergence of more young and radical political forces in the country changed the established status-quo. According to Kashin, the 2014 Hong Kong protests also known as the Umbrella Revolution "had a negative impact on the [China-promoted] concept of 'one country-two systems' in Taiwan." At that moment it became clear that the socio-political atmosphere in Taipei is "developing in the direction undesirable" for the People's Republic of China (PRC). On the other hand, Donald Trump's victory in the 2016 presidential elections marked a new era in Sino-American relations, with the new US president challenging both the South China Sea status quo and the One China policy, which has long been regarded internationally as a "sacred cow." Simultaneously, the Trump administration signaled its willingness to step up the supplies of advanced weapons to Taipei, for instance, the Lockheed Martin F-35 stealth multi-role fighters, the expert noted, adding that the issue of the balance of power on the two sides of the Taiwan Strait has recently taken on a new significance. However, Kashin threw into doubt Easton's idea of the PRC's special plan for the forceful annexation of Taiwan in the near future: according to the expert, Beijing is inclined to regulate relations with its neighbor through diplomatic means in the first place. Citing the US researcher, Kashin noted that in any event Taiwan's military power would have played a secondary role in the hypothetical conflict with China: the US' ability "to come to Taipei's rescue" and to integrate Taiwan into its strategic planning would be the key to the resolution of the situation. "Easton, apparently, calls for viewing Taiwan as a… country allied to the US," Kashin noted, "However, this approach will have wider global consequences. In fact, it means declaring a cold war to the PRC, which will be fought on all fronts and will be much more bitter than the current [political] confrontation between the US and Russia." According to the expert, Washington simply can't afford to get bogged down in a conflict with China: The US has already dragged itself into a nearly irreversible diplomatic standoff with Russia, in addition to its protracted military missions in the Middle East and Afghanistan. For its part, Beijing has full freedom to act on the global arena, boost its geopolitical influence and modernize its military forces, Kashin stressed. According to the Russian expert, with its options limited all the US can do is to continue steadily expanding weaponry supplies to Taiwan.